MadgeTech and MK Scientific are taking data logging in Japan to a whole new level as MadgeTech Cloud Services expands availability across the globe. This development allows users to manage and monitor environmental parameters such as temperature and humidity, right from the convenience of their smartphone or other internet enabled device. MK Scientific offers an extensive selection of measurement equipment for a wide range of businesses throughout Japan, and serve as the country’s premier distributor of the MadgeTech product line. Hitting the market in Japan right now is MadgeTech’s newly released RFC1000 Cloud Relay, which transmits real-time data from wireless data loggers directly to the MadgeTech Cloud. This data logging hub uses a built in Ethernet connection for internet access, so no computer is required. The simplicity of this system allows users to be up and running in minutes and monitoring data in real-time is as easy picking up a smartphone or tablet. The RFC1000 Cloud Relay is compatible with MadgeTech’s entire line of wireless data loggers allowing this system to satisfy monitoring needs in many different industries. Typical applications include laboratory, medical storage, warehouse, pharmaceutical processing or any facility that requires a controlled environment and continuous monitoring. 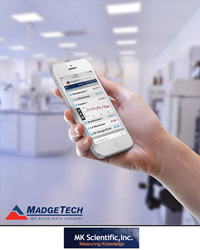 MadgeTech Wireless Data Loggers combined with the MadgeTech Cloud Services deliver a system that is affordable and scalable to accommodate small operations or large facilities with multiple locations. MK Scientific also offers specialized solutions for monitoring harsh environments. The HiTemp140 series is MadgeTech’s top selling line of stainless steel temperature and pressure data loggers. The rugged design is built to withstand the high temperature, humidity and pressure of autoclaves and sterilization cycles. The series includes a wide selection of probe lengths and styles, including dual probe models or data loggers with M12 connectivity, compatible with interchangeable probes for application flexibility. Together, MadgeTech and MK Scientific will continue to provide the latest cutting edge technology to clients in Japan with solutions and tools that are guaranteed to produce accurate and reliable results. To see more MadgeTech product offerings available contact MK Scientific.